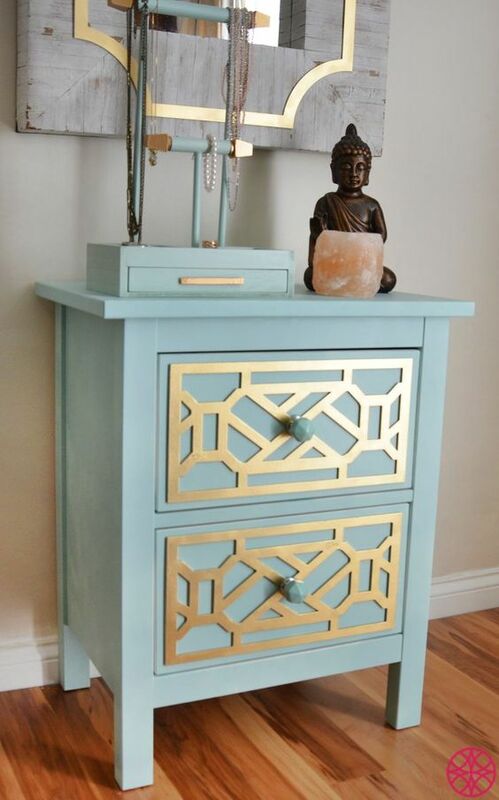 Okay, so a nightstand isn’t exactly the showstopper piece in your room, but it IS part of your decor. Don’t underestimate the power this oft overlooked piece can have when it comes to the style in your home. 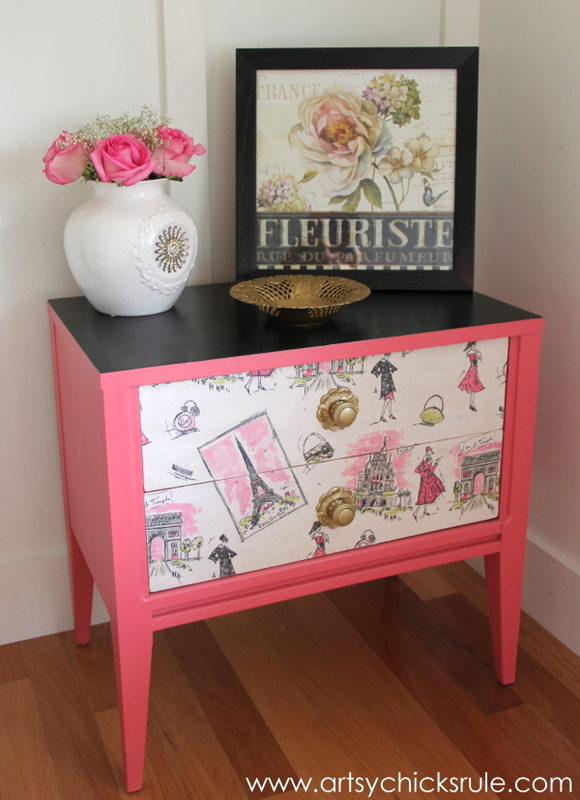 Here are 11 ways to update a boring nightstand. Does your nightstand look like it’s right out of the ’90s? It’s definitely time for an update then! But no need to go drop hundreds of dollars on a totally new nightstand. Just sand it down and refinish the paint. 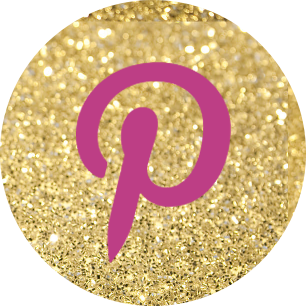 My absolute favorite paint to use is chalk paint! It makes it so easy to give your piece a bit of distressed look if you’d like. Michael’s sells over 15 color varieties of my preferred paint brand, Americana. To me, knobs and pulls are like the jewelry on furniture. You so do NOT have to keep the factory standard knobs! Add some bling and personality by replacing boring knobs with ones that are much more YOU! World Market is one of the BEST places to find unique knobs! How cute! 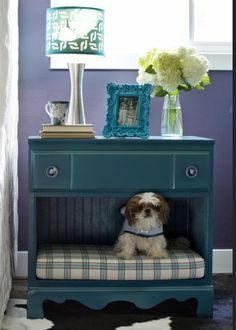 Keep Fido or Fluffy nearby but off your sheets by converting your night stand into a little pet hideaway. A soft cushion makes it a perfectly comfortable bed. Add some dimension and depth by sticking wallpaper inside the storage shelf. Peel and stick wallpaper is an excellent choice for the job. 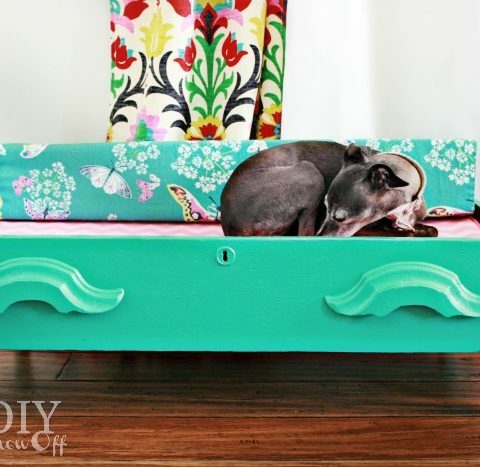 Use fabric as a way to give your nightstand more of a voice. You can’t miss this nightstand shouting out in French! C’est très jolie, non? Perhaps the easiest way to update your nightstand is to refresh the display accessories. Find items that accentuate room colors and bring in added warmth. If you share your room with a significant other, also try to bring in ways to highlight your relationship. 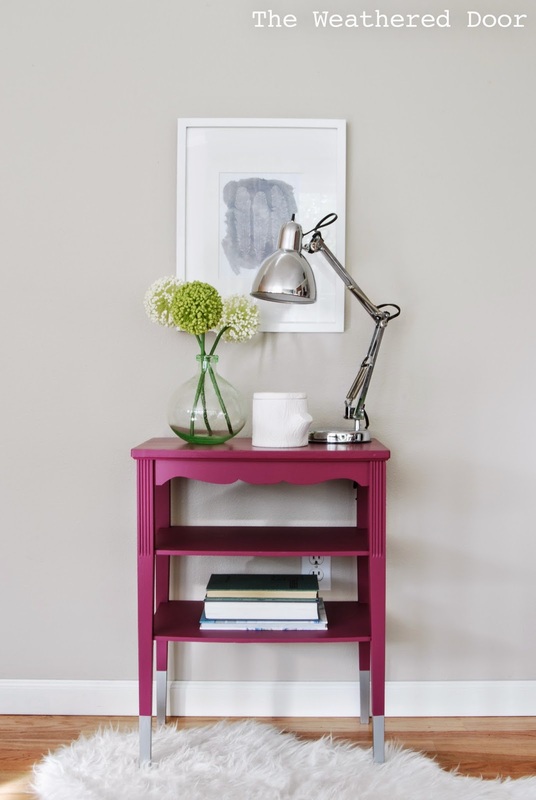 Another way to update your nightstand is with a decorative O’verlay. It’s a paintable patterned panel that fits onto most surfaces to give it a more customized look. Subtle yet striking. If you’d like to go with a multi-toned look but don’t want to do anything too drastic, consider the option of dipping. 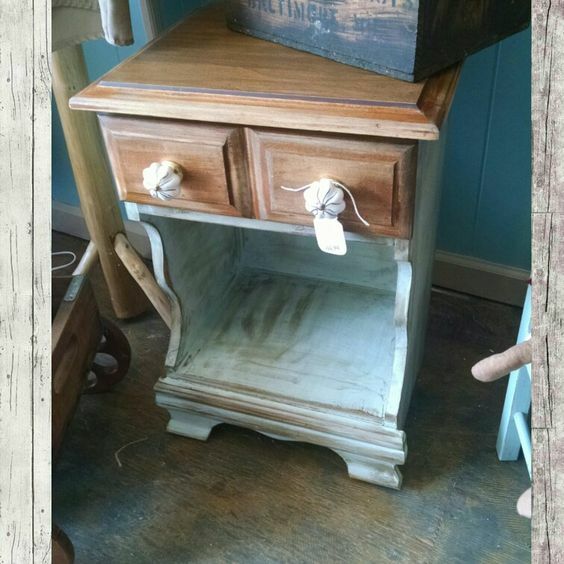 While you don’t literally dip your furniture in paint, you do finish it to look as though a portion of the bottom has been dipped. Modern and chic! These aren’t your old ruler stencils from elementary school! 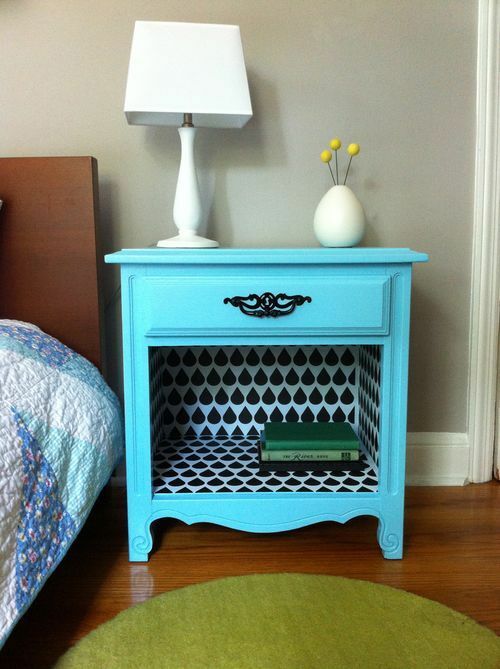 Use affordable and easy furniture stencils to add modern patterns to your nightstand for an updated look. Satisfy your wanderlust with this nightstand revamp. 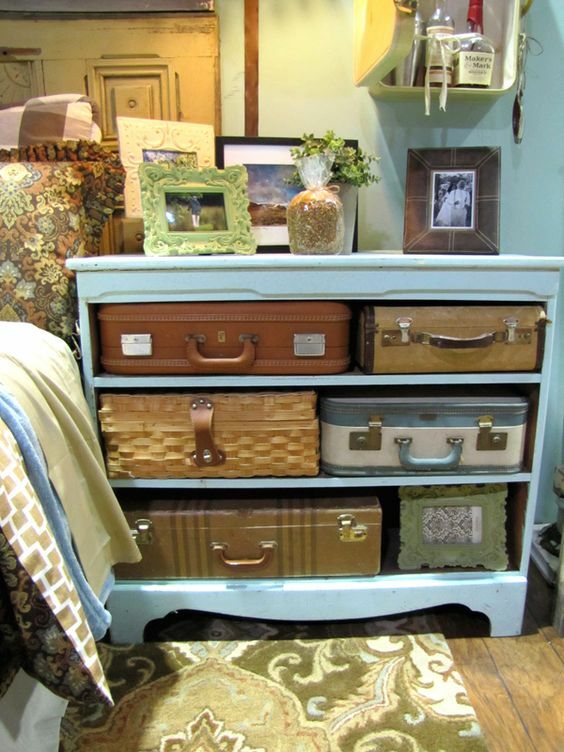 Fill in space or replace drawers with vintage luggage. Simple really can be better sometimes. 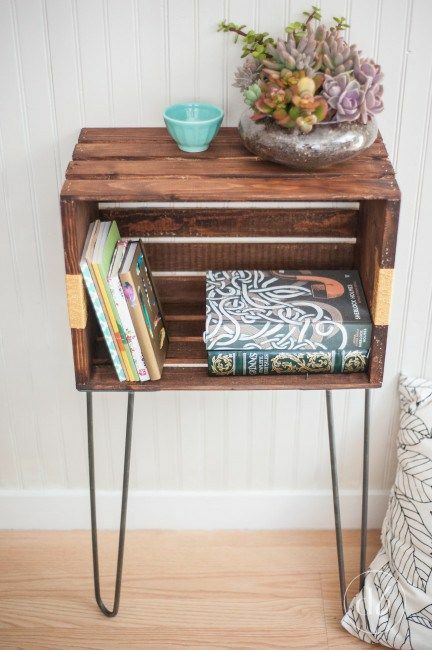 I love how simple this crate box nightstand is with a rich stain and very basic metal legs. Let your accessories and BOOKS do the talking for you with this one.